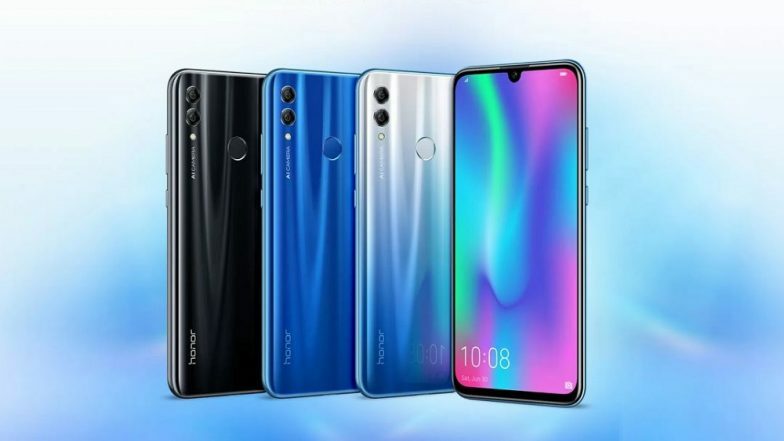 New Delhi, March 18: Huawei's sub-brand Honor on Monday launched a 3GB RAM+32GB internal storage variant of its recently launched "10 Lite" smartphone for Rs 11,999 in India. Powered by Kirin 710 chipset and 3,400mAh battery, the smartphone features a 13MP+2MP dual rear camera set-up and a 24MP Artificial Intelligence (AI) selfie camera packed in a dewdrop display. Huawei Smartphones & Laptops Will Run on Its Newly Developed Operating System To Combat Any Potential Ban on Android & Windows. "The new variant of '10 Lite' builds on its legacy featuring the AI Selfie camera with a comprehensive lineup of storage and memory to power the new era of selfie-strong smartphones," said Suhail Tariq, Chief Marketing Officer (CMO), Huawei Consumer Business Group, India. The new variant is available on Flipkart in sapphire blue and midnight black colours. Earlier in January, the company launched the smartphone with the base 4GB RAM+64GB storage variant costing Rs 13,999 and the 6GB RAM+64GB storage model priced Rs 17,999. The '10 Lite' is also the first phone from Honor to run the latest EMUI 9.0 operating system (OS) out of the box.